I have just opened my mail today and I practically tore open my package from Daisy Chain Collective as I was sooo excited! 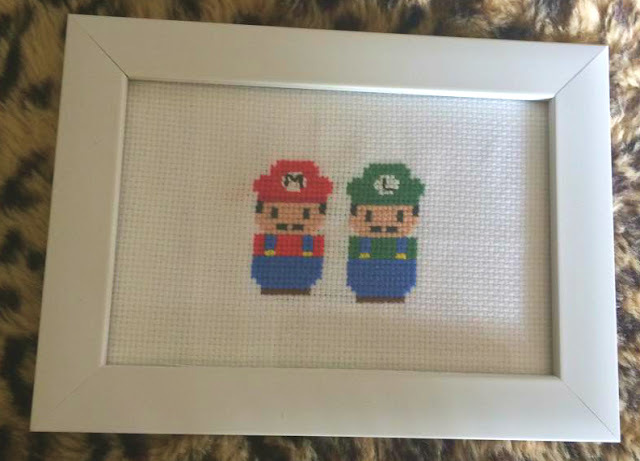 I received a beautiful made to order Mario & Luigi Cross Stitch and I'm so pleased with it. Gemma actually takes custom orders and can make any video game characters that you like! She makes a whole host of different cross-stitches such as Game of Thrones themed ones, Adventure Time etc etc. There really is something for everyone on Daisy Chain Collective! Apologies for the rubbish lighting today but here it is! The design is so cute and it's stitched super precisely, I bet this took ages to do. I'm really happy with it, it looks adorable in its little frame and I can't wait to put it up. I definitely 100% recommend Daisy Chain Collective @ Etsy for all your cute cross stitch needs. This was made so quickly considering that it's a made to order item and I'm beyond thrilled with how it turned out.